With a cheery chime, a small, squarish minibus eased forward and tentatively took to the “highway” Dec. 12, advancing to a top speed of 3 miles per hour in the frigid morning air punctuated by a dash of swirling snow. The road was actually part of the Minnesota Department of Transportation’s MnROAD cold-weather pavement testing facility, a self-contained area in Monticello not open to normal traffic. And the bus — more like a moving pod, really — is part of MnDOT’s Autonomous Bus Project, a pilot program for pilotless vehicles that will help determine how they operate in cold weather. The clime in Monticello did not disappoint, as MnDOT hosted a phalanx of media to show off the project. The public will get a peek during Super Bowl LII festivities, when the buses debut on Nicollet Mall. The technology is being tested throughout the country, from Uber’s driverless taxis in Pittsburgh to autonomous minivans operated by Waymo (Google’s driverless car company) in Phoenix. State highway departments such as MnDOT will provide the infrastructure as well as the policy and regulatory know-how to help welcome them. From a transportation standpoint, experts say we live in a potentially transformative time — with driverless technology affecting road safety, congestion, land-use decisions, mobility for seniors and the disabled, and the consumption of fossil fuel. It’s hard to know when driverless vehicles will go mainstream, but the University of Minnesota’s Frank Douma says it will be sooner than most people think. “One thing I’ve learned about this technology is that if you put a date on it, it will happen earlier,” Douma said. 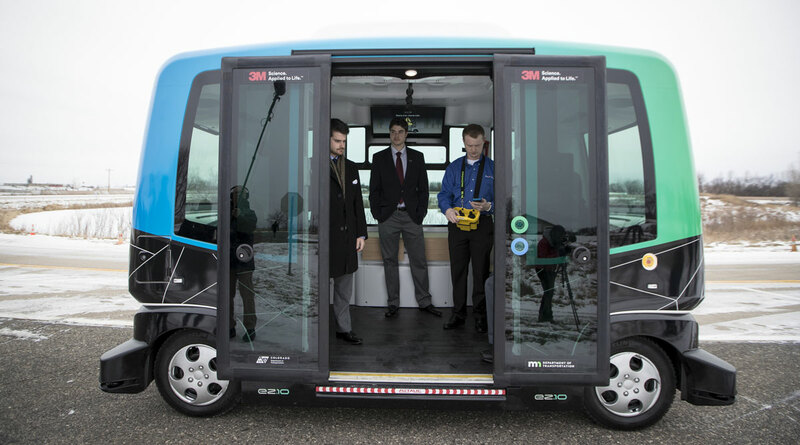 MnDOT’s test program uses a shuttle bus manufactured by EasyMile, a French company specializing in driverless technology. Maplewood-based 3M provides films that protect and enhance the sensors in inclement weather. The heated vehicle can hold up to 12 people (sitting and standing), and its decor can be described as utilitarian-meets-IKEA. It has no steering wheel or gas pedal. It runs on a pre-mapped route and the average speed is about 15 miles per hour. Joseph Holmes, EasyMile’s sales director, says the bus has been tested in California and in the Arlington, Texas, entertainment district between the Dallas Cowboys and Texas Rangers stadiums. “We’ve had no accidents,” Holmes said, noting the buses are designed to work in more controlled environments, such as preplanned communities. EasyMile has also tested the vehicle in Finland and Norway, but Minnesota will be the first cold-weather test case in the United States. The project will last through February and take into account the road salt used on Minnesota’s roads. A series of lasers helps the vehicle detect potential roadblocks, such as pedestrians and bicyclists. On Tuesday, as the bus toddled along the test track, it stopped when a snow squall suddenly kicked up near its nose, perhaps mistaking it for a polar bear. It also halted as it tried to reconnect to its server. The vehicle will be tested on a closed segment of Nicollet Mall from 3rd Street to 4th Street on Jan. 26-28, as well as Feb. 2-3. More information will be posted on MnDOT’s website. Douma, a transportation scholar at the U’s Center for Transportation Studies, said the demonstration will help people overcome their fear of driverless vehicles.